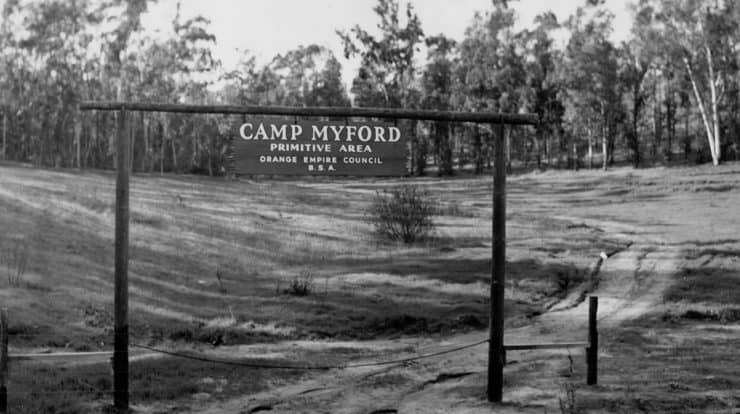 The 340-acre Peters Canyon Regional Park has an interesting history. 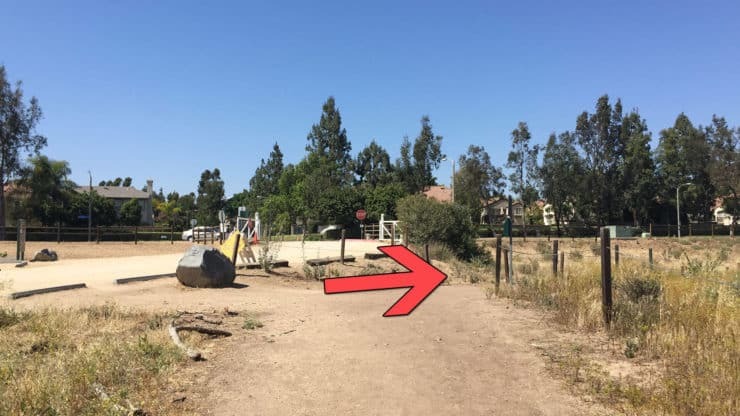 The lake in the park was once a reservoir that was used to irrigate James Irvine’s orange groves, and now drains out to Upper Newport Bay. 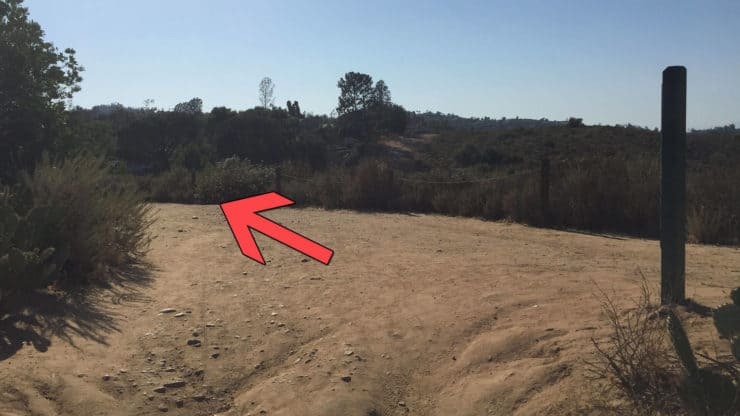 In 1899 one of the first golf clubs in Orange County was built here. During World War II there was an Army base here, and after he war the Boy Scouts took it over. 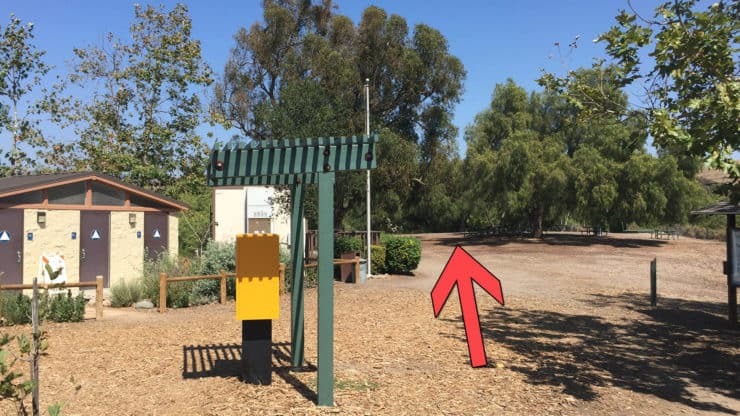 In 1992 the area became an Orange County park when the Irvine Company donated the land for public use. 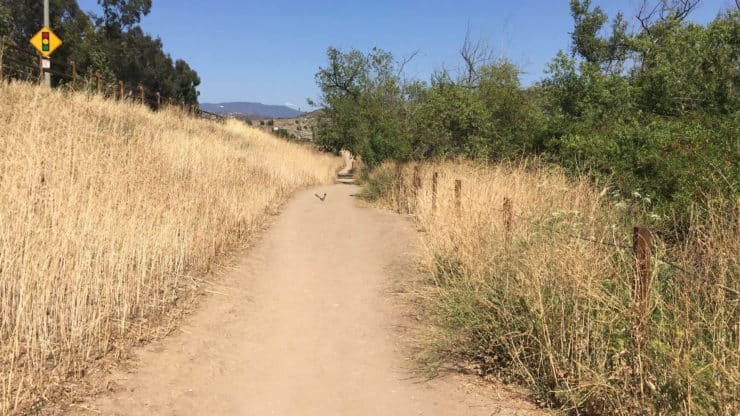 Today Peters Canyon Regional Park is popular with hikers, exercisers, horses, and mountain bikers. 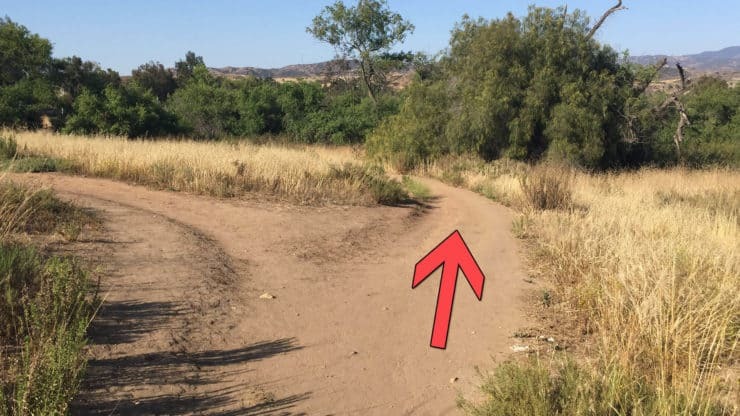 Be considerate, keep your eyes open, and share the trail. 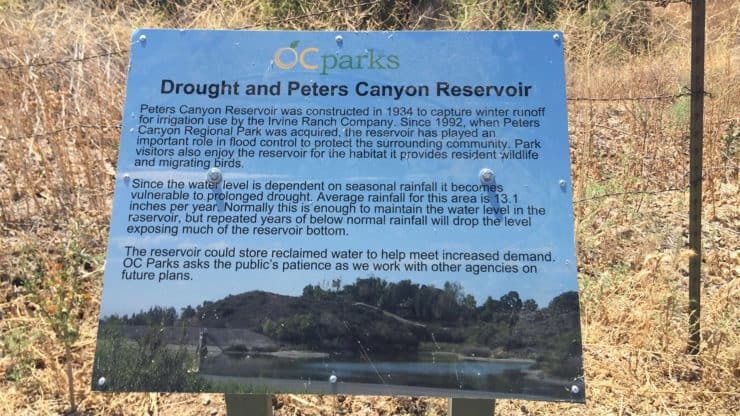 If California is in a draught, the Upper Peters Canyon reservoir will likely be dry. 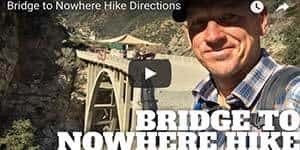 Don’t let that stop you, this is still a great hike. If there’s water in the reservoir, expect even more wildlife around. I’ve seen mule deer, coyotes, rattlesnakes, and tons of birds here. 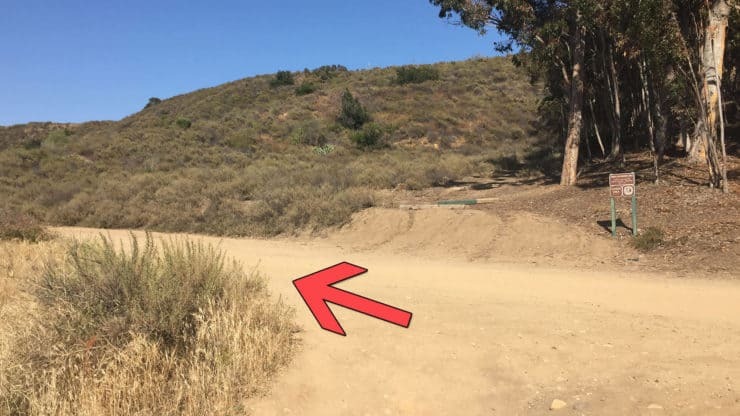 Where is Peters Canyon Regional Park? 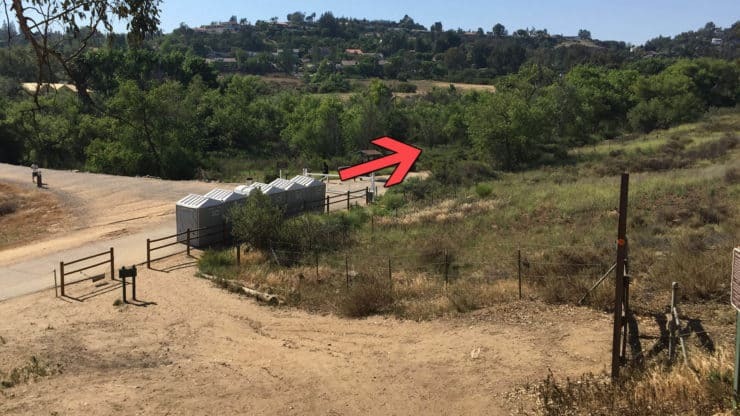 Use this trailhead address: 8548 E. Canyon View Ave, Orange, CA 92869. 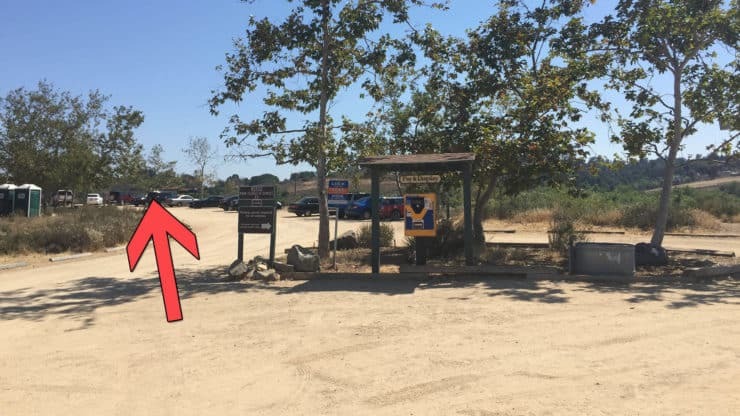 This hike guide starts in the main parking lot (on the north side), which has plenty of room and bathrooms, but also a small fee. There are other areas where you can park on the street and access the park if you want to save the fee. There’s a small fee to park. 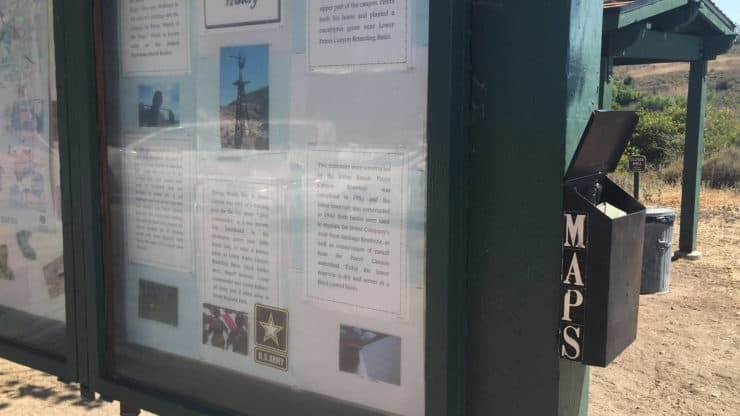 Print a ticket out at the kiosks in the parking lot, and leave it on your dashboard. The address for the hike is the park entrance on the north side of the park. Use the solar meters to pay with cash or credit cards, and leave the receipt on your dashboard. Make your way to the far end of the parking lot. 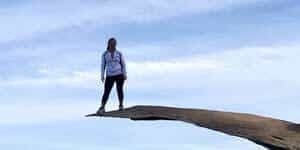 This is a hike you can do in workout gear or hiking gear. It can get very hot in the summer, so bring plenty of water. 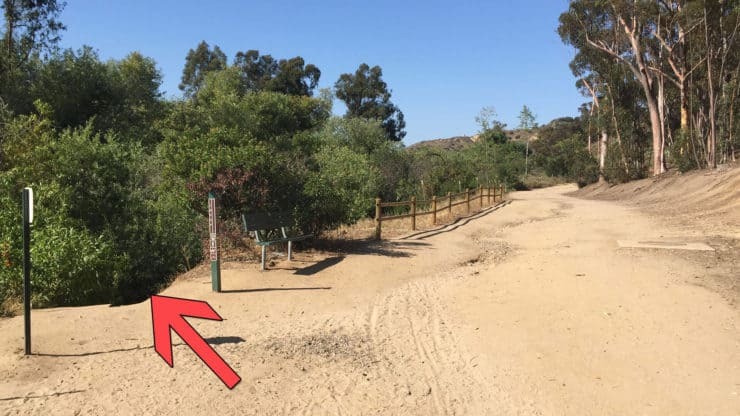 There are usually official Peters Canyon hiking trail maps at the trailhead, and you can also print one out here. 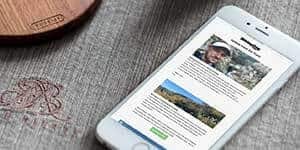 If you want to do a shorter hike, the map will give you plenty of hiking options, otherwise my guide and maps will do the trick. 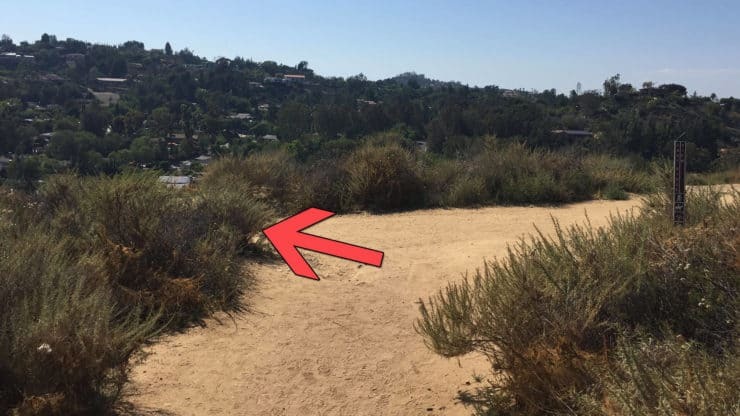 There are free hiking maps at the hiking board. Take one in case you get lost. Keep it in good shape and return it when you’re done. The hike covers the entire park, which is wedged nicely in between a residential area. 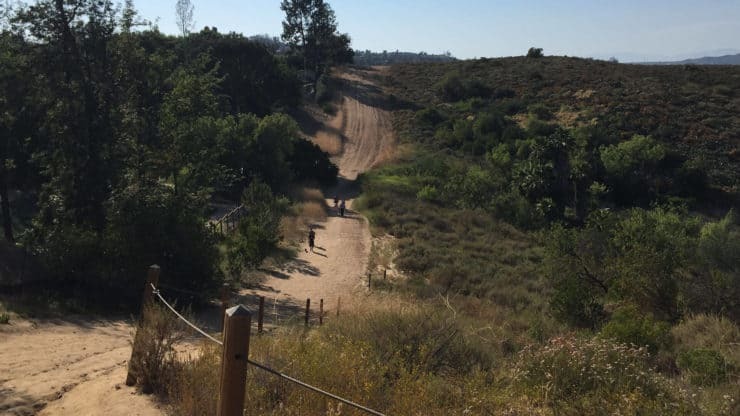 Peters Canyon is really an oasis within suburbia. 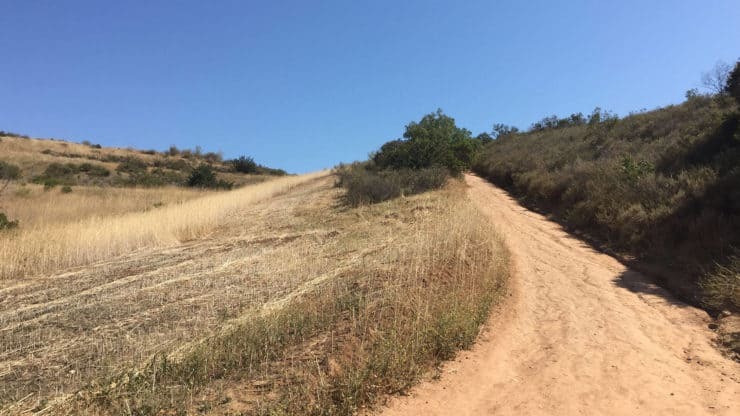 There’s one really steep hill, and then the rest of the hike is pretty gradual up and down. From the end of the parking lot, hike to the left. There are bathrooms here. 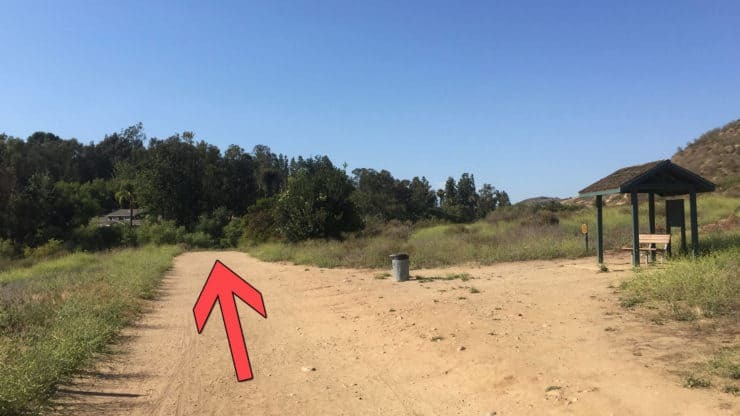 You’ll hike on the trail around the parking lot. Keep hiking to the right. The trail goes along the road, keep hiking straight. 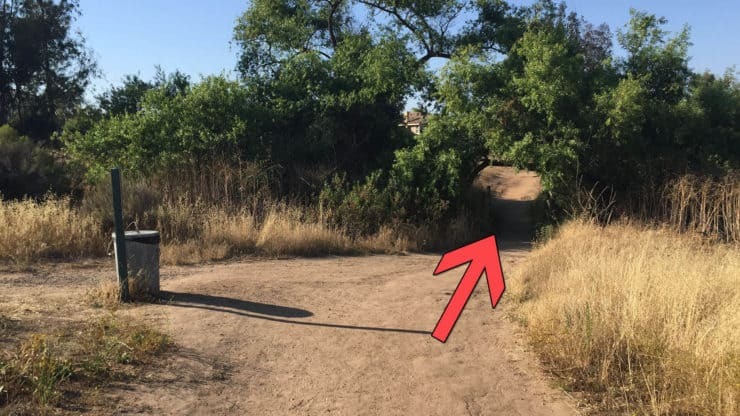 Check out the road runner crossing the trail in the picture. 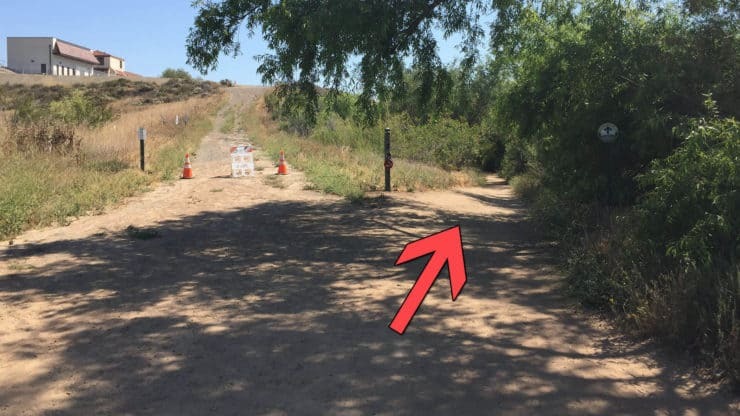 Skip the shortcut through the bird area to the right at 0.2 miles. You could see some birds and snakes around here, keep your eyes open. 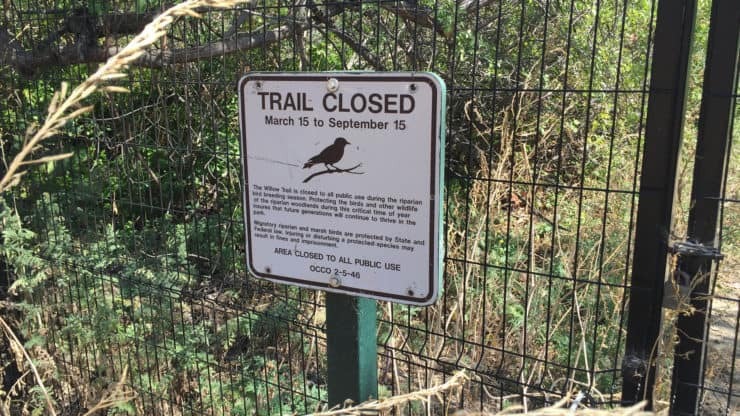 The shortcut I just mentioned is closed for half the year. Avoid touching plants. 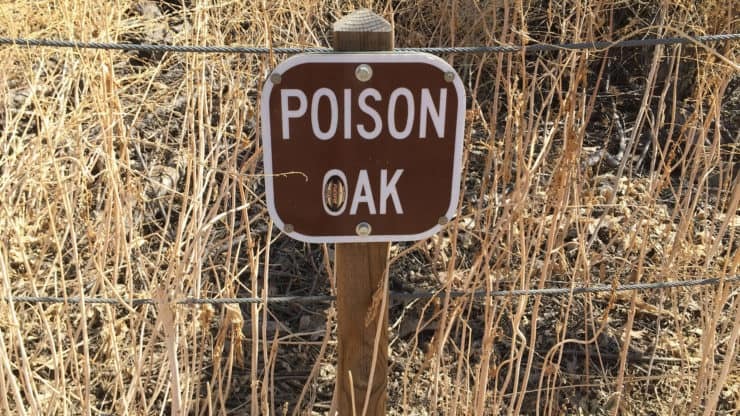 You’re in poison oak country. At the corner, hike through the gate to the right. 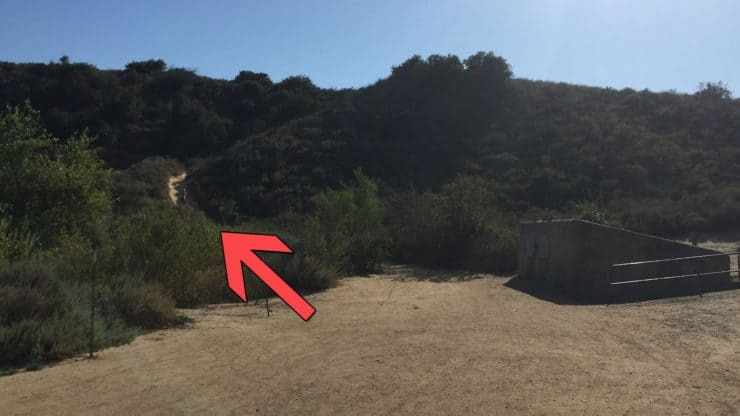 At about 0.4 miles, after hiking through the gate, hike to the right. If it’s a drought year, the reservoir might be empty. The park has good signs explaining various aspects of the park and ecology. 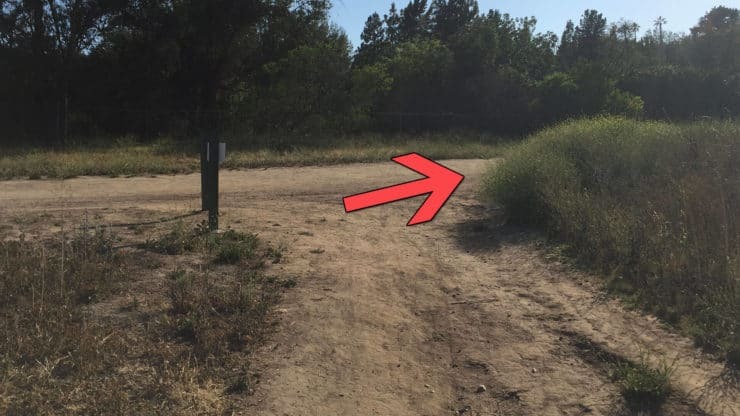 At about 0.8 miles, you’ll arrive at a big trail intersection. Hike to the left up the hill. Follow the sign for East Ridge View Trail. It’s a tough little climb up, but the views are worth it. 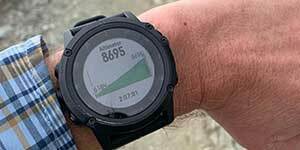 At about 1 mile, you’ll reach the summit. 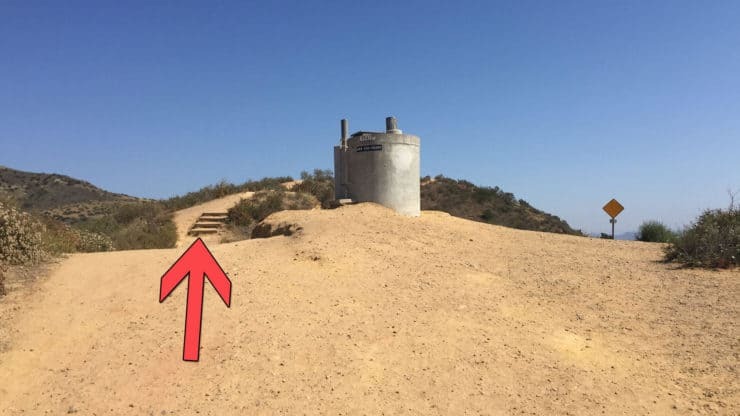 Climb to the top of the concrete tower for an even better view, then continue hiking to the left. 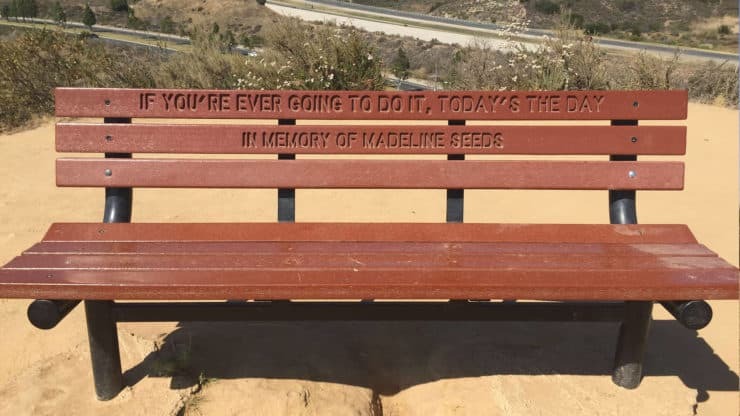 What a great bench to enjoy the view at the summit. Catch your breath and enjoy the views. 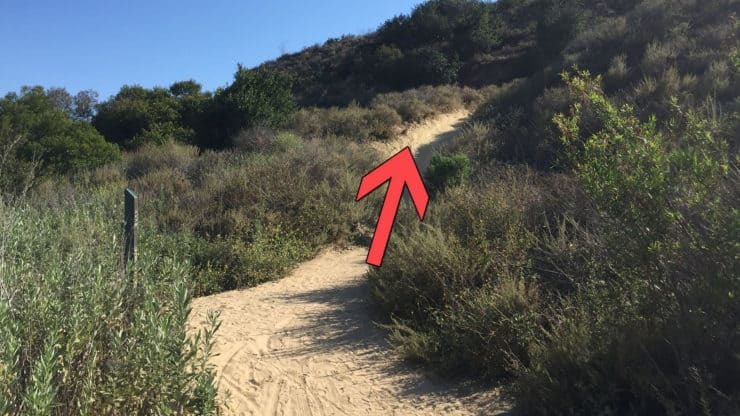 Continue hiking down the hill, and at 1.3 miles, hike to the left at the bottom. After the last turn, hike the next quick left. 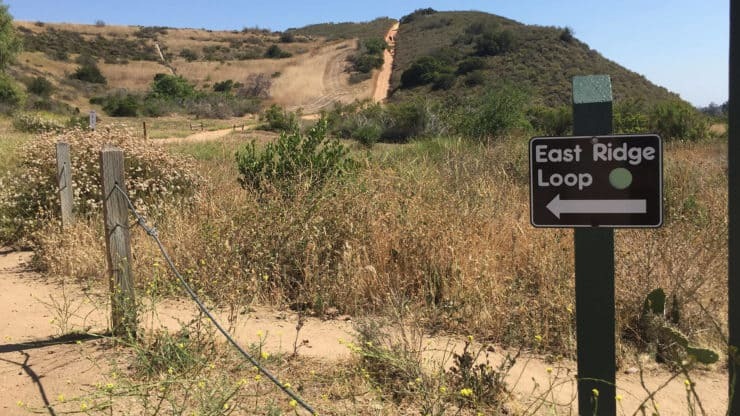 At about 1.8 miles, the East Ridge View Trail intersects another trail. Keep hiking straight. 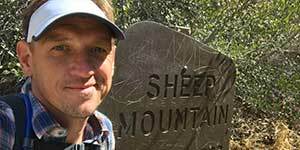 At 2.4 miles, you’ll reach the end of the East Ridge View Trail. 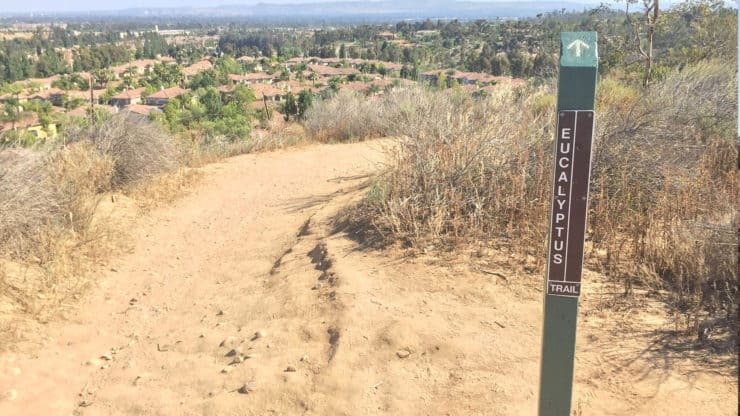 Hike right onto the Eucalyptus Trail. 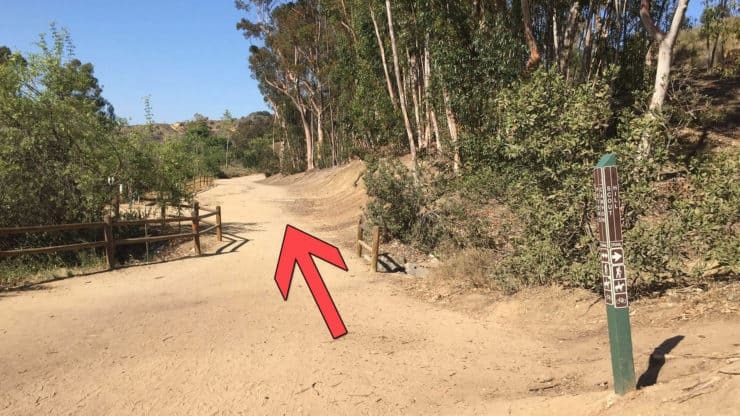 You’ll see trail markers for the Eucalyptus Trail. Keep hiking straight. 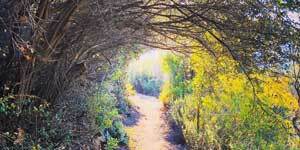 As the Eucalyptus Trail ends around 2.7 miles, hike to the right on the Peters Canyon Trail. This is also the place for a bathroom break. 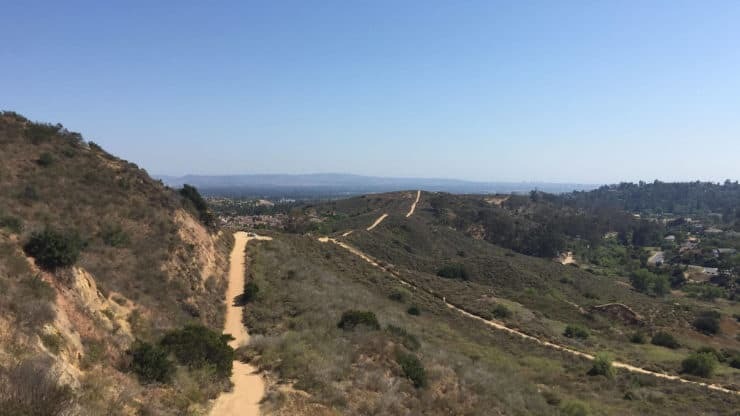 Continue hiking up Peters Canyon Trail. 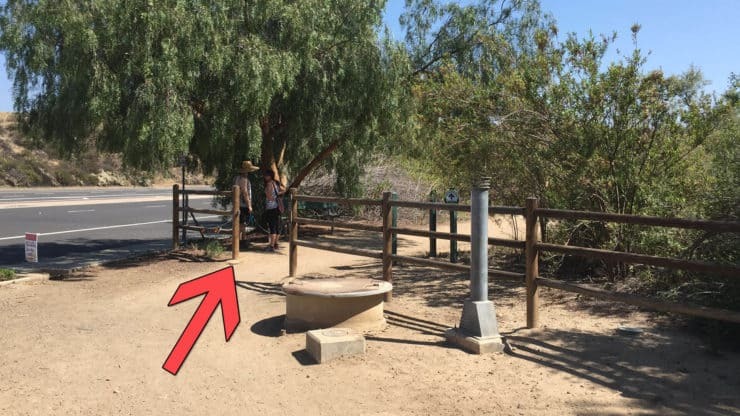 At about 3.2 miles, continue through the trail junction. Immediately after that last junction, hike to the left onto the Creek Trail. The Creek Trail is nice and shady. Keep your eyes peeled for animals that come to the water for a drink. 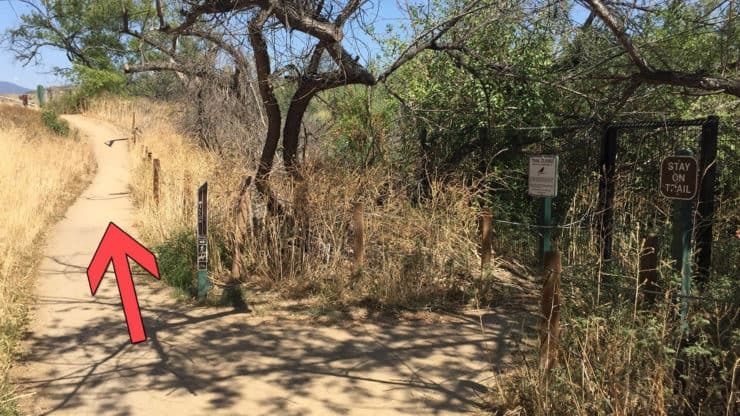 A 3.5 miles, the Creek Trail ends at Peters Canyon Trail. Hike to the left. 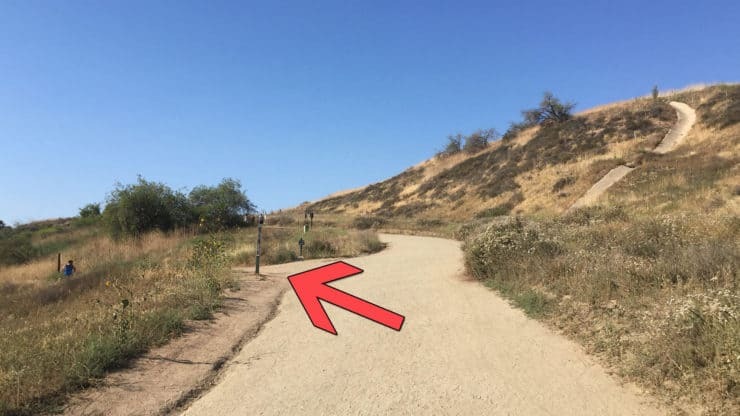 Continue straight on Peters Canyon Trail as other trails split off. 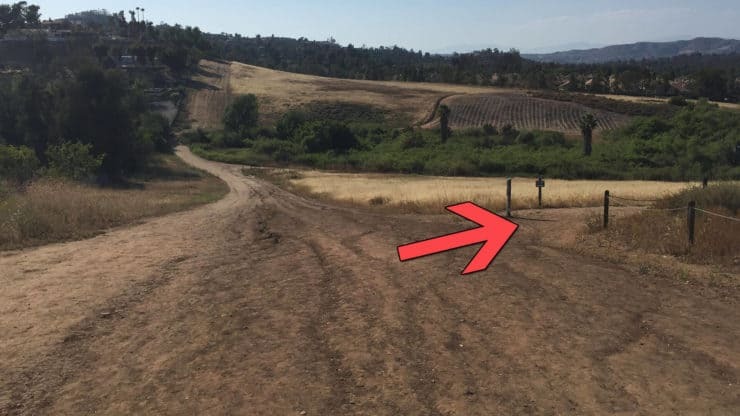 At 4 miles, continue hiking straight through the intersection. 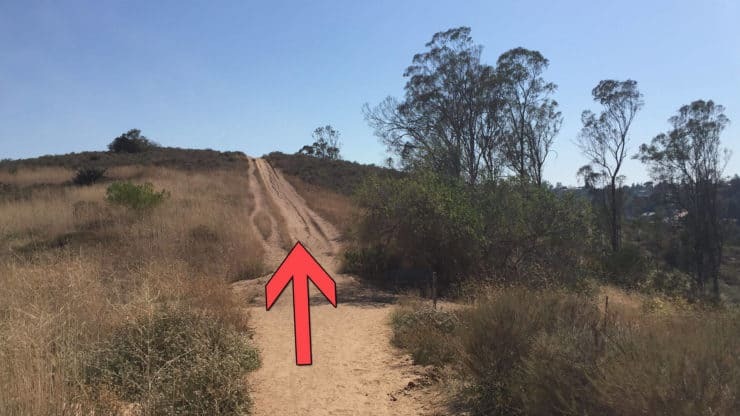 At 4.1 miles, you’ll come back to the intersection you were at earlier, before the steep climb. Make the left onto the Lake View Trail. 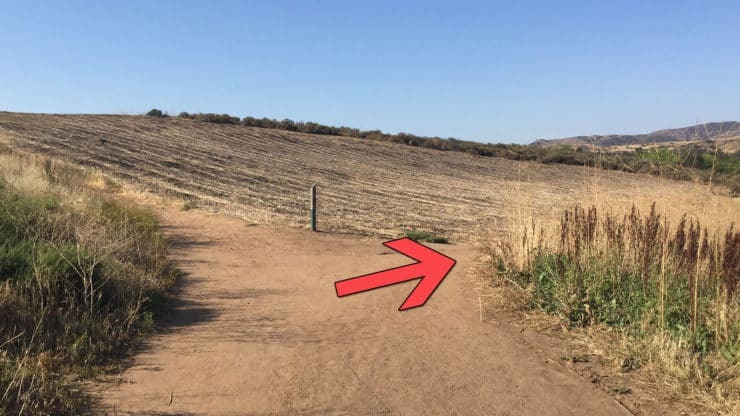 Hike past the dam, and head to the smaller trail on the left. 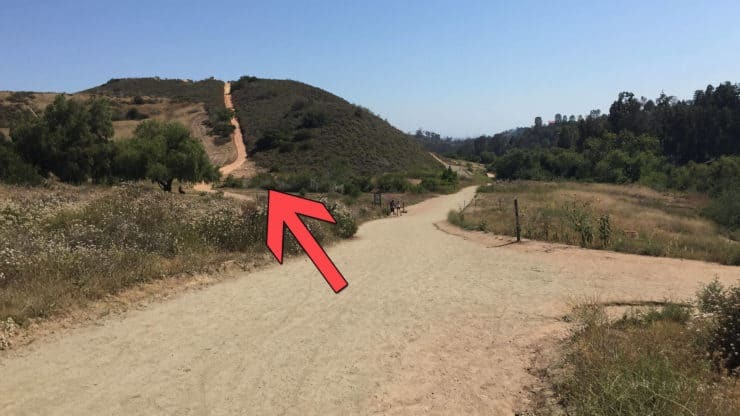 When you start the climb, there’s a trail to the left, continue hiking up the hill to the right. 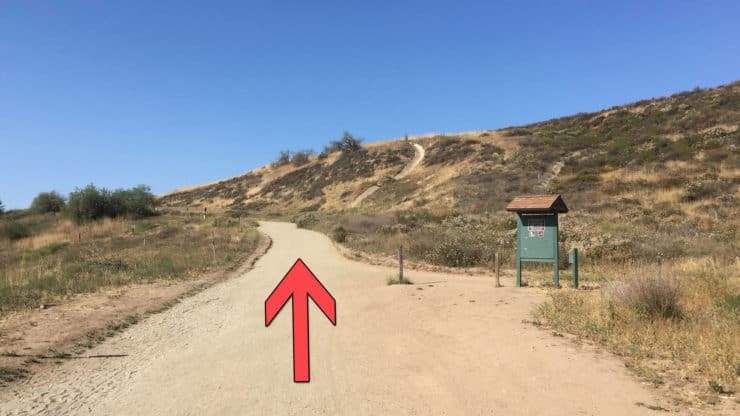 At 4.4 miles, you reach the top of the climb. Hike to the left. 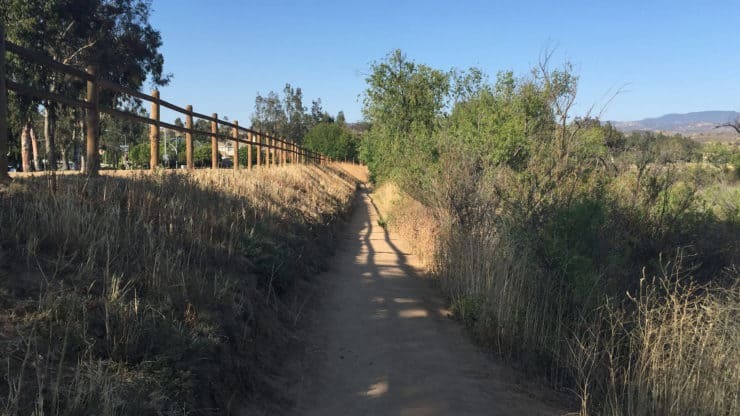 The trail goes down along the edge of Peters Canyon park. Keep hiking on the trail. 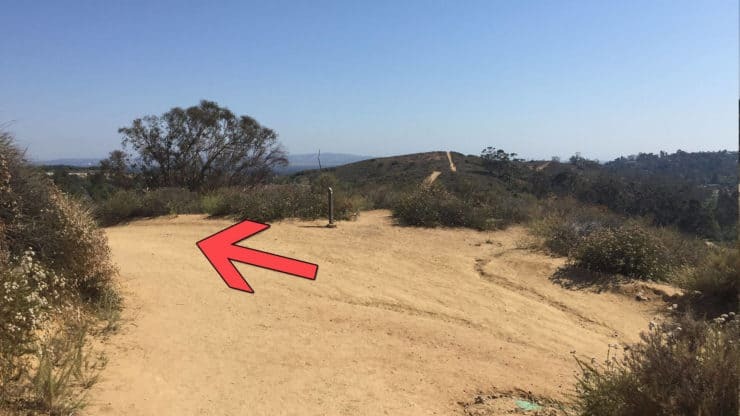 At 4.6 miles, hike to the right onto Cactus Point Trail. 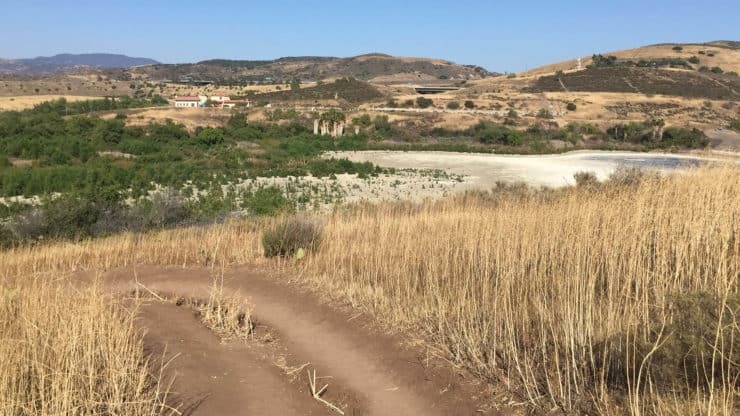 On this day, Peters Canyon reservoir was dry from the drought. If there’s water, you’ll get nice lake views and wildlife spotting opportunities. At the end of Cactus Point Trail, hike to the right. At about 5.2 miles, keep hiking right on the Lake View Trail. At 5.4, keep hiking right on the Lake View Trail. 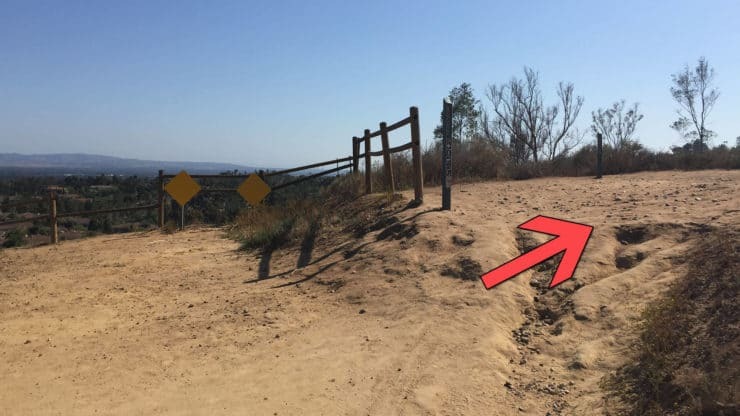 Again, keep hiking to the right and avoid trails to the left. The trail follows the road again. You’re almost there. 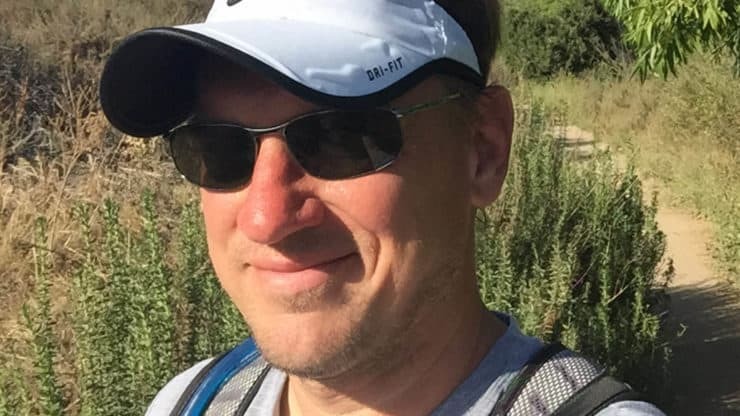 You just finished the Peters Canyon hike, congratulations! 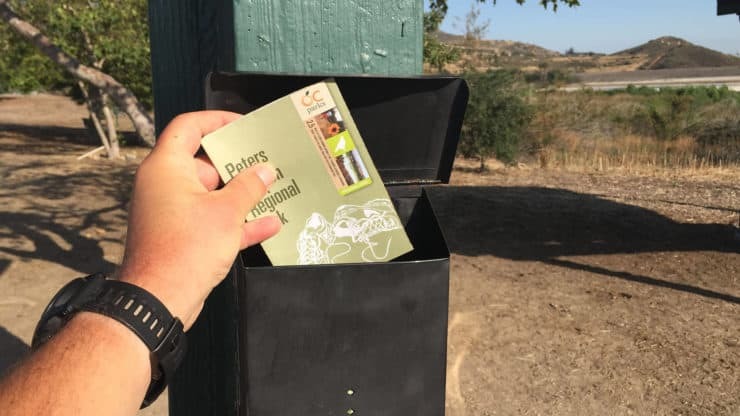 Put your map back in the box so others can enjoy the park. Hope you had fun on the hike! 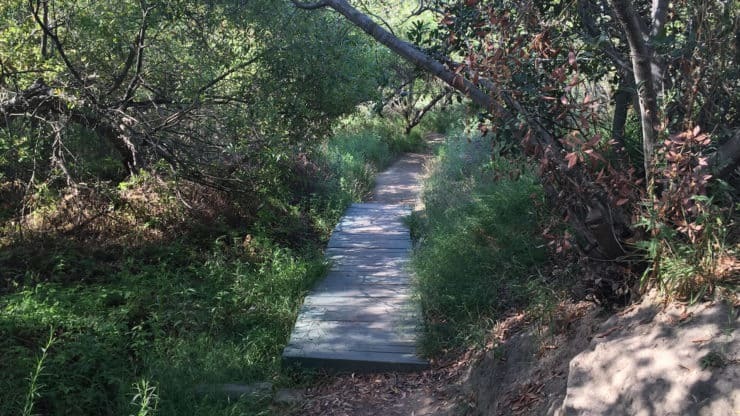 Be sure to check out my other hikes in Orange County.